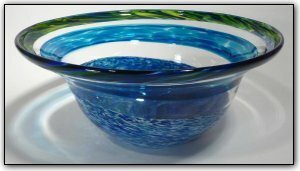 This incalmo bowl is made from five separate sections of deep blues, luscious greens, and elegant clear bands. Incalmo is an extremely complex technique where each section is made separately and then they are joined one at a time while the glass is still hot. The basic process of incalmo involves blowing two separate individual bubbles, which are then cut and fused along their rims before final shaping. This particular bowl has five separate sections meaning it required five separate bubbles. Make sure to zoom in to see the true depth of the colors. The green band has so many subtle shades and the bottom section is so deep and rich that it is mesmerizing like looking into the deep blue waters of the Caribbean. Such a breathtaking incalmo bowl!